Mahr Federal’s 130B-24 Gage Block Comparator is truly the preferred choice of all major calibration laboratories. 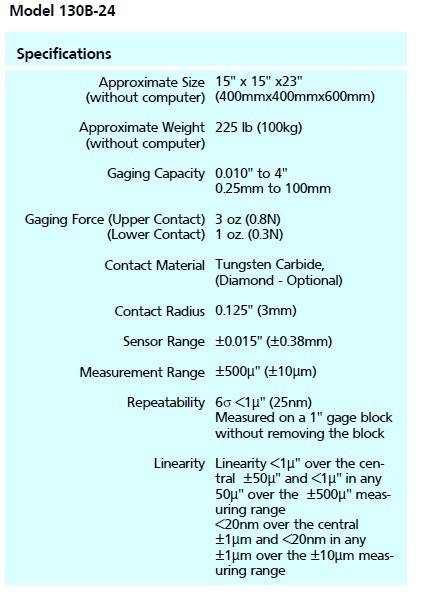 It is specifically designed for the measurement of gage blocks by comparison, with no compromises made. The Model 130B-24 provides the ultimate in resolution and reproducibility for measurement of industry’s most important dimensional standards. Unique “Floating Measuring Frame” assures true point-to-point measurement. Single sensor design for the lowest possible electronic noise. Precise counterbalancing for control of measurement forces. Resolution of 0.1 microinch/0.001 micrometer. Repeatability of 0.2 microinches/0.005 micrometers (6s < 1 microinch/0.025 micrometer). 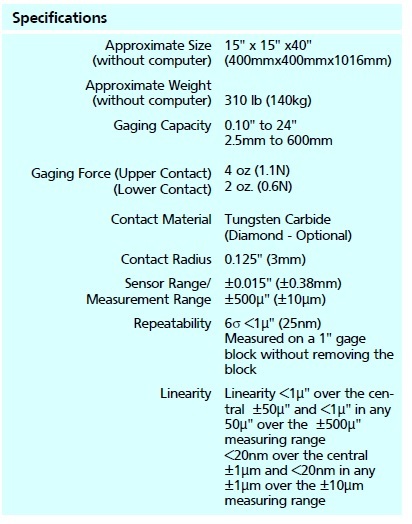 Measurement capacity from 0.010″ through 4″ (0.25 mm through 100 mm). Integrated measurement software and user interface. 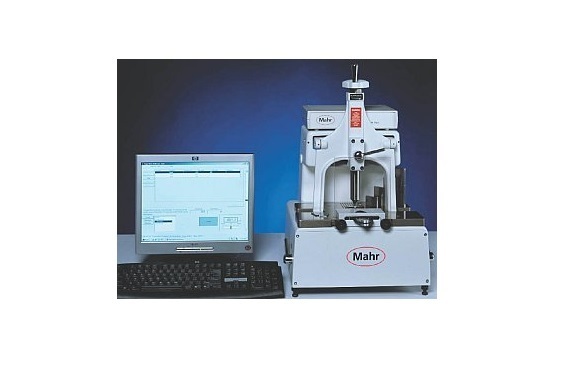 Built-in positioner for reproducible measurement locations. Same highly linear, stable electronics as 130B-24. Designed for measuring blocks above 4.000″ (100 mm) but capable of checking shorter blocks as well. Linear ball slide for smoothly moving long gage blocks without danger of tipping them over. Large platen area for staging blocks before measurement – critical to achieving thermal equilibrium with the gage. Fully counterbalanced “floating measurement frame” to isolate measurements from vibration. Open frame design allows comparison measurement of large disks, up to 24″ in diameter. Can be operated from the same computer as 130B-24. Scale on left-hand post allows rough positioning, and micrometer-style spindle allows smooth, easy mechanical fine-adjustment.